Rocket-ship engines work by accelerating reaction mass in opposite direction, thus providing thrust. But this mass doesn’t just vanish when it leaves the engine. 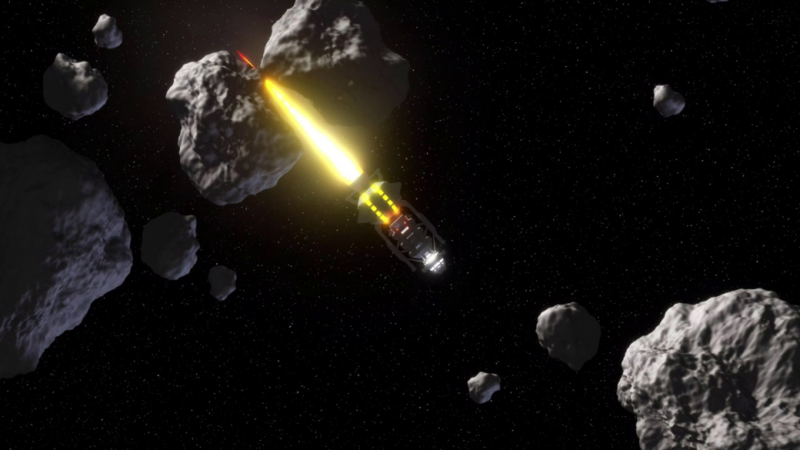 In dense environment of the Ring, pilot has to be aware of the reaction of their own engines on the surrounding asteroids. Since conception of ΔV i wanted to keep it as real as possible. Having exhaust actually affect surrounding is a nice touch both from gameplay and graphical perspective. Combined with ability to completely control thrusters it allows stunts otherwise impossible – like pushing aside asteroids while flying by them. I need to reconsider the thruster/engine sprites. While they do usually look good, they just straight go through asteroids. Game is handling exhaust by creating physical particles and accelerating them with opposite force. While they work just fine, their appearance is more fuzzy. There certainly are different approaches to this. A fun thing to investigate tomorrow.